SheerCMS, the free ASP.Net Content Management System. It's easy, it's simple and you can get your own web site up and running in just minutes! 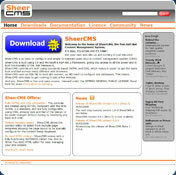 SheerCMS is an easy to configure and simple to maintain open-source content management system (CMS). SheerCMS is built using C# and Microsoft's ASP.Net 2 Framework, giving you access to all the power and in built functionality of the .NET framework. SheerCMS controls are built using standards based XHTML and CSS, which makes it easier to get the same look and feel accross many different web browsers. SheerCMS uses an XML file to hold site content, so NO need to configure any databases. This very feature will make SheerCMS easy to get running within just a few minutes. · Fully XHTML and CSS compatible - The controls are created using XHTML, compliant with the W3C XHTML 1.0 standard, and are fully configurable using CSS. This allows the look and feel of the design to be easily changed without having to modifying any back end code. · Simple to maintain - SheerCMS has an online administration console that allows addition, modification and deletion of all content, uploading images and configuring site settings from anywhere in the world. · Multiple template pages - SheerCMS allows the content editor to select from multiple page templates allowing the page layout to be specially configure for the content being displayed. · No hard HTML coding - SheerCMS comes with a fully functioning WYSIWYG (What-You-See-Is-What-You-Get) HTML editor for easy managing your site content. · Many in built controls - SheerCMS comes with a number of fully integrated controls that can be added to your page templates to provide menu functionality, simple, page content searching, a guestbook and much more. · Extensible - SheerCMS is built using Microsoft's .NET 2.0 Framework. This allows for a website built using SheerCMS to take advantage of all the features and controls that are part of ASP.Net. You cannot download any crack or serial number for SheerCMS on this page. Every software that you are able to download on our site is legal. There is no crack, serial number, hack or activation key for SheerCMS present here. Our collection also doesn't contain any keygens, because keygen programs are being used in illegal ways which we do not support. All software that you can find here is freely downloadable and legal. SheerCMS installation package is prepared to be downloaded from our fast download servers. It is checked for possible viruses and is proven to be 100% clean and safe. Various leading antiviruses have been used to test SheerCMS, if it contains any viruses. No infections have been found and downloading SheerCMS is completelly problem free because of that reason. Our experts on malware detection tested SheerCMS with various spyware and malware detection programs, including fyxm.net custom malware and spyware detection, and absolutelly no malware or spyware was found in SheerCMS. All software that you can find on our servers, including SheerCMS, is either freeware, shareware or open-source, some of the software packages are demo, trial or patch versions and if possible (public domain licence), we also host official full versions of software. Because we want to be one of the fastest download sites on the web, we host all the software including SheerCMS on our servers. You cannot find here any torrents or download links that would lead you to dangerous sites. Rate SheerCMS 0.9.1 Beta 2!